This is the fairest mainstream news article we've seen yet, but that's not saying much. All the others have been nothing but lavish praise for the push to amend the Constitution and extolling the virtues of the gruppenfuehrer. The article mentions academics that Orin Hatch, a pomp of Schwarzenegger's, trotted out before the Senate Judiciary Committee and spoke of how great it would be to amend the Constitution for "our great leader." However, the article didn't mention all the other academics who testified against the proposed amendment back in 2003. Arnold Exposed.com has still not been contacted by national television to be able to add the view against amending the Constitution to the debate. The wall-to-wall coverage of Arnold's minions is only intensifying. In recent national polls, upwards of eighty percent of Americans are against amending the Constitution. TV and internet news polls have been running ninety-five plus percent against amending for Arnold. This afternoon, a USAToday Poll reported that 87% of Americans are against amending the Constitution to allow naturalized citizens to become president. Read the below article, the best the mainstream media has to offer, and help us spread the word about the national movement against amending the Constitution. Should the Constitution be amended for Arnold? 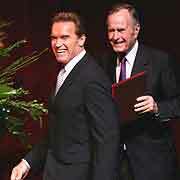 Former President George Bush, right, introduces California Gov. Arnold Schwarzenegger before presenting him with an award. Through more than two centuries, it usually has taken a weighty cause to survive the burdensome process of amending the U.S. Constitution. Americans hold the work of the Founding Fathers in such reverence that they've added to it only 17 times since 1791. That's when the first 10 amendments were codified as the Bill of Rights. Now, debate over a proposed 28th Amendment is focused on the popularity and political future of one man: macho Republican Arnold Schwarzenegger, the former bodybuilder and action-movie star who has been California's governor for barely a year. With a bit of encouragement from the Terminator himself, some of Schwarzenegger's supporters are pushing for a constitutional amendment that would allow the Austrian-born governor to run for the White House as soon as 2008. Schwarzenegger is blocked by Article 2, Section 1, Clause 5 of the Constitution. It reads, "No person except a natural born citizen ... shall be eligible to the office of president." The 12th Amendment says the vice president cannot be foreign-born. Could America's infatuation with Schwarzenegger lead to passage of a constitutional amendment that would drop those bans — an idea that has died in Congress more than two dozen times since the 1870s? Probably not, but Schwarzenegger's rise in politics has led members of Congress and a few of the governor's wealthy California donors to launch a long-shot campaign that they have cast as an effort to guarantee equal rights for millions of foreign-born Americans. If the movement gains significant momentum, it might create some interesting political scenarios. It could become a test of American attitudes toward immigrants in the post-9/11 era, and put a spotlight on the depth of conservative Republicans' feelings about Schwarzenegger, who supports abortion rights and gay civil unions. The bar to the nation's highest offices is the only formal restriction on the rights of the USA's 12.8 million foreign-born, naturalized citizens, who are among the 34 million U.S. residents born abroad. Every year, 450,000 immigrants are naturalized, including 25,000 children adopted by citizens. Proponents of change note that 700 immigrants in uniform have been awarded the Medal of Honor since the Civil War, and that 60,000 now serve in the military. Sen. Orrin Hatch, R-Utah, a political ally of Schwarzenegger, introduced the Equal Right to Govern Amendment in July 2003, a few weeks before the actor declared his candidacy in the recall election in which Californians ousted Democrat Gray Davis as governor. If Hatch's amendment is adopted, an immigrant who has been a naturalized citizen for 20 years could run for president or vice president. Schwarzenegger, 57, has been a U.S. citizen since 1983. He has retained Austrian citizenship. Hatch's resolution must withstand daunting tests for proposed amendments: approval by two-thirds majorities in both houses of Congress, followed by ratification by three-quarters of the states — 38 of them. As the departing chairman of the Senate Judiciary Committee, Hatch boosted the amendment with favorable testimony from academics and legislators at a public hearing Oct. 5. Sen. Arlen Specter, R-Pa., who will head the committee in the congressional session that begins in January, says he hasn't made up his mind on the issue but will put it on the panel's agenda. Few proposed constitutional amendments have fared well recently. The Equal Rights Amendment, which took aim at gender discrimination, died in 1982 after 35 states had ratified it. Amendments to ban burning the U.S. flag and gay marriage have died in Congress. The gay-marriage measure might be revived next year. Despite Schwarzenegger's wealth, fame and 65% voter approval rating in California, "it's the longest shot in a life full of long shots" for him, says Lissa Morgenthaler-Jones, 47, a Silicon Valley businesswoman and Schwarzenegger campaign donor. With her husband and a friend, Morgenthaler-Jones started the Web site www.amendforarnold.org in August to rally support for an amendment. The group paid $20,000 to run a TV ad in California over six days in November. "You cannot choose the land of your birth," Morgenthaler-Jones says in the ad. "You can choose the land you love." "Forget about it," she says. "It is not going to happen. The process takes years, and this is as far as it goes." Morgenthaler-Jones is more optimistic. She's counting on Schwarzenegger's high profile to draw attention to what she sees as a matter of individual rights, and she predicts an amendment will be ratified within six years, if not in time to qualify Schwarzenegger to run for president in 2008. The barrier to foreign-born citizens becoming president stems from fears that the Founding Fathers had during the Constitutional Convention of 1787. They were concerned that subversive enemies could force the fledgling republic back to foreign monarchical rule. Delegates didn't want the United States to suffer the same fate as Poland, which in 1772 had been partitioned among Austria, Prussia and Russia after agents of those countries bribed Polish nobles to elect a disloyal king. The restriction on the foreign-born "has become an anachronism that is decidedly un-American," Hatch said during the hearing in October. Akhil Amar, a professor of constitutional law at Yale Law School, agrees: "Today, to worry about foreign dukes and earls, it's really a little paranoid." But Sen. Dianne Feinstein, D-Calif., a Judiciary committee member, sees merit in the restriction. "I don't think it is unfair to say the president of the United States should be a native-born citizen," she said at the hearing. "Your allegiance is driven by your birth." Polls aren't showing a national groundswell for putting a foreign-born citizen in the Oval Office. In a USA TODAY/CNN/Gallup Poll taken Nov. 19-21, 31% favored such an amendment, and 67% opposed it. Opposition dropped slightly, to 58%, when Schwarzenegger's name was included in the question. Even among Republicans, the idea of an amendment hasn't taken hold. A Newsweek poll of 374 Republicans in September indicated that 30% would like to see Schwarzenegger run for president if the Constitution allowed it, while 57% said they wouldn't like it. "Some people are talking as if a Manchurian Candidate could emerge and take over," says Rep. Dana Rohrabacher, R-Calif., referring to the Richard Condon novel and the two movies it inspired, in which communists brainwash an American to assassinate a presidential candidate. Rohrabacher has introduced a House resolution that mirrors Hatch's proposal in the Senate. "Remember, the Manchurian Candidate was an American," Rohrabacher tells those who envision a foreign-born mole groomed for U.S. leadership. If the question reaches the floor of Congress, "it would be very hard to vote against it without looking small or mean or bigoted," Amar says. Supporters of an amendment often note that the Constitution disqualifies from top offices immigrants who have shown loyalty in positions of public trust. Henry Kissinger (who was born in Germany), Madeleine Albright (Czechoslovakia) and Christian Herter (France) were secretaries of State. Retired Army general John Shalikashvili, a former chairman of the Joint Chiefs of Staff, was born in Poland. Schwarzenegger gets the attention, but others in high offices could benefit from what has become known on Capitol Hill as the "Arnold amendment." Michigan Gov. Jennifer Granholm, a Democrat, was born in Canada. (When online surfers reach amendforarnold.org, the Web site's message is a bipartisan "amend for Arnold and Jen.") Sen.-elect Mel Martinez, R-Fla., was born in Cuba. Labor Secretary Elaine Chao is from Taiwan. Rep. Pete Hoekstra, R-Mich., chairman of the House Intelligence Committee, was born in the Netherlands. So far, the most vocal opposition has come from people who simply don't like Schwarzenegger. Alex Jones, an Austin-based host of a syndicated radio talk show, says he is a former Republican turned "libertarian and independent." His Web site, www.arnoldexposed.com, features negative stories about the celebrity governor that Californians heard during last year's recall campaign. They include allegations that Schwarzenegger sexually harassed women during his Hollywood days, and that his father was a Nazi. "He's a bully and a preening peacock who is totally power-mad," Jones says. "For God's sake, don't let this megalomaniac become president." Morgenthaler-Jones says Schwarzenegger "made pleased noises" in August when she told him of her plans, and he gave her group a photo for its fundraising T-shirts. In April, he said in a joking manner that he would run if the opportunity arose. At an international travel-industry show in Los Angeles, he said, "I thank you very much for changing the Constitution of the United States of America, and I accept your nomination to run for president." Pause. "Oh, wrong delegation. Sorry, wrong speech." In some ways, Schwarzenegger already is "acting as if he wants to be president," the Los Angeles Times editorialized Nov. 20. On a trade mission to Japan last month, Schwarzenegger had his picture taken with Prime Minister Junichiro Koizumi, who called him "more popular than Bush." Schwarzenegger has visited King Abdullah II of Jordan and Israeli Prime Minister Ariel Sharon. He's planning visits next year to China and Europe. His square-jawed face is on billboards in a dozen cities from Florida to Seattle, touting California as a place to do business. Lately, the governor has distanced himself from the presidential question. During a news conference in Sacramento on Nov. 3, he said, "This is a debate that people will have ... all over America, and I hope they leave me out of that debate. Otherwise, it becomes kind of a political debate between Democrats and Republicans." He has a point. Matthew Spalding, director of the Center for American Studies at the conservative-oriented Heritage Foundation, says the amendment's prospects would "nosedive" if it were perceived to be designed to land Schwarzenegger in the Oval Office. "We don't amend the Constitution to advance someone's political career," Spalding says. Schwarzenegger faces an additional handicap, Spalding says: "You can't have a United States president who is a dual citizen." Proposals to end the Constitution's sole discrimination against the foreign-born have kicked around in Congress since the 1870s. But 26 proposed amendments have died in subcommittees. In the new Congress, the Hatch-Rohrabacher amendment will compete with a bipartisan House resolution that would impose a 35-year citizenship requirement. If that approach becomes law, Schwarzenegger would have to wait until 2020 to run for president. He'd be 73. A similar option: postponing an amendment's effective date for 10 years after it's ratified, essentially removing today's politicians from the equation. "Let's take Arnold Schwarzenegger and Gov. Granholm off the table," Spalding says. The highest barrier to an amendment could be a suspicion of foreigners that surveys suggest has deepened among Americans since the 9/11 terrorist attacks. "Most Americans have an instinctive distrust of foreigners," says Forrest McDonald, a retired University of Alabama professor of American history, "and this has not changed appreciably in the last two, three, four years, since almost everyone in the world is against us on the Iraq thing." Only Schwarzenegger's charisma has kept an amendment from being hooted down, says John Smolenski, an assistant professor of history at the University of California-Davis. "The idea that this would even be on the table is purely a testament to him." If identifying an amendment with Schwarzenegger "helps it pass, that's fine with me," says Rep. Vic Snyder, D-Ark., a sponsor of the plan with the 35-year citizenship requirement. "But it's really about kids — kids now in kindergarten or grade school or junior high, getting their dreams lined up."